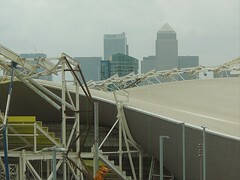 Winding down the Olympic Dream, a photo by thehutch on Flickr. At the weekend, I was in Stratford and took a few moments to get some glimpses of the Olympic Park. It looks very different now as many of the facilities are being removed or prepared for a new future and the joys of the summer have been consigned to history. The Olympic Games in London were a resounding success but things cannot remain the same, change has to come, in order that the outlays on the site have a life beyond the Summer 2012 and the best use of resources are made. How do we prepare? Do we prepare for just the event? or do we prepare for the future beyond it? Some call it legacy, some common sense, in truth it is sensible planning? Enjoy the past but do not forget to prepare for the future by making the best of the present.